Home » Interesting Discussions » Your Say: Do you expect beauty bloggers to be experts at makeup application? 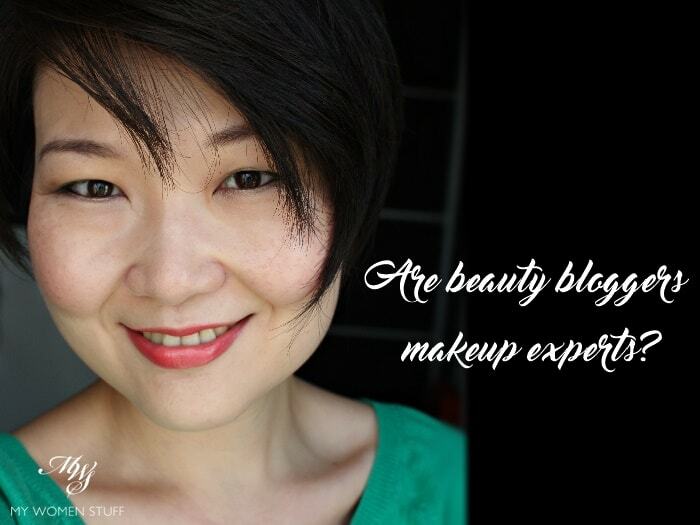 Your Say: Do you expect beauty bloggers to be experts at makeup application? But after I got over the initial irritation, I started wondering if that’s what readers perceive of bloggers. Is it the general perception that bloggers all know how to do immaculate magazine-cover makeup? Or that if a blogger is talking about a makeup product, they must therefore be able to trowel it on, and look perfect at every angle, contoured and highlighted to within an inch of their life. Is that what you think? Speaking as a blog reader, I do like seeing how a makeup product looks on the skin, whether by way of swatches or product application. However, because my own makeup skills are limited (which I freely admit), I will admire how a product can ideally look on someone who has immaculate makeup, but I also like seeing it on bloggers who adopt a more everyday makeup sort of look, where a bold colour could be tempered for daily wear, or perhaps a simple eyeshadow look that I might be able to replicate with the same product. I usually can’t be bothered to layer on primers or pile on makeup for anything, mostly because my makeup is worn for a practical everyday purpose, and the truth is simply that, on an everyday basis, I wear pretty light, work-friendly makeup. So, I like seeing variations of that. So, I like to think that there’s blogger or blog for everyone. I’m not a fan of the heavy makeup looks that we see a lot of these days. All the layering and highlighting and contour, or the latest “baking” trend just isn’t my cup of tea. If anything, it complicates and confuses things. Those who do it are terribly skilled at it, and for that, I take my hat off to them, as they look absolutely flawless. But is it a look I’ll go for? No, it isn’t. Perhaps, if I had to face the cameras all day long, I might. But as I’m no Kim Kardashian, I’m happy doing what I do and playing with colour my way – to enhance, not change how I look. Do you perceive beauty bloggers to be highly skilled in makeup application? Makeup, like skincare, is very personal. A particular technique might work on a particular shape of the feature that could never work on me. So, to expect a beauty blogger to be an expert at makeup, well, I’d say yes to a certain extent but only as an expert to his/her face/features. Unless the beauty blogger is a professional makeup artist who’s had exposure to all sorts of facial/feature shapes, it’s unreasonable to have that sort of expectation. That makes a lot of sense. The thing is, not all of us care nor aspire to be makeup artists, and I do think that looking presentable online and showing how YOU would wear the product serves its function. That said, I suppose putting it out there does mean you put yourself under the microscope. Just depends on whether you actually care what happens then! No, I don’t expect a blogger to be an expert at makeup, but I do expect some skill-especially if they’re showing eyeliner or eyeshadows on their eyes. I mean it doesn’t have to be perfection, but you know an even eyeliner application at least, if ya’ know what I mean. I like seeing products on a bloggers face because at least it shows that they maybe use the products. I’m not a fan of blogs that just show swatches and that’s it. Like lipstick swatches just on the hand or arm, and not showing the lipstick on your lips and face bothers me A LOT. Same for foundations as well! But, the bloggers I love and read do that already haha. Like you said, there’s a blogger for everyone! And I’m with you about all the heavily contoured, highlighted, bake to high heaven makeup looks-NOT FOR ME. And it won’t be for them either as they get older LOL-that’s when they’ll maybe realize it’s ridiculous to walk around like that. Oh yes like you, I too prefer that a blogger actually shows how a product looks on their faces. It does help give a better idea of what it might look like when worn, especially with lipstick. Swatches can only take us so far, and not having any swatches at all is equally unhelpful! But I do wish the heavy makeup trend will die already. I don’t see many people walking around looking like that, so really, where/when will the need arise when you need to put on a mask vs your own face?! No offence taken, Mi and thank you for sharing! Like you, I do expect a certain level of expertise e.g. no harsh eyeshadow lines, properly drawn eyeliner etc but not to the level of a makeup artist. It would be a disservice to the MUA who go for lessons and practice for hours! Sorry to be the blur one here… what does FOTD stand for? I’m with Tracy. I mean, swatches are fine, especially for eye shadows / blushes but if they want to show how it looks on their face, then I do have an expectation that they’ll apply it properly. Like, maybe with some blending skills? I’m not in favour of those heavy makeup trend nowadays, because I’m all about natural every day makeup. The market is so huge, there’s bound to be something for someone out there, but yeah, some people just don’t really know when to keep quiet. When you have nothing nice to say, just shut up. Then some will say, But I’m entitled to my opinion! Yes, the entitled. Hhmph. I once cringed when I received a PR invitation to host an event in their store as a “makeup expert” because I’m supposed qualified a blogger, when really they are just looking for someone to work for free to boost product sales. Back to your question though, when I watch a tutorial or FOTD blog post, the skill of application is helpful in witnessing a makeup product’s performance in action, but is not essential, nor is it the only aspect of researching a product before deciding to buy it. At the end of the day, I value a blogger’s ability to write an authentic review that speaks to me beyond pictures, not their ability to apply makeup professionally! Ha ha bloggers are certainly not Lisa Eldridge . Else we would be called make up artist instead of blogger la . The person is confuse. I like your everyday make up look n enjoy reading your makeup review. Thanks Lavender and yes, if we were all Lisa Eldridge then she’ll be out of a job! LOL! The person who left that comment is just an overly entitled idiot. Are they paying for your posts and is the boss of you? Since the answer is no, they shouldn’t expect anything. If one not happy with what the blogger produces, then stop reading/unfollow etc. duh. I follow a mix of beauty bloggers some who just do comprehensive swatches (all the pretty colours! ), some who do heavy makeup w the works, some who do everyday looks; and those who write honest reviews and impressions. As long as I like their writing and their style/values. I totally agree with you. I feature makeup reviews and applications for the real middle-aged woman, being one myself. I therefore don’t have a massive following as a result because my blog is fairly niche, In the sense that i use only high end products and i talk a lot about how these products will work with more maturing skin. I do not profess in any way to being some incredible makeup artist. In fact my FOTD’s will clearly prove i am not. I HATE (yes i did use capitols deliberately) heavy makeup looks. It looks too drag queen and false for me. No, i don’t apply my eyeliner perfectly and yes, my makeup is natural and not cakey. I would say that i write very honestly about beauty products to help people make more informed choices because beauty products are so expensive and in the UK; you cannot return them once opened or used. I don’t expect much from a beauty blogger but if you’re on Youtube and you’re intentionally doing a make-up tutorial with eyeshadow involved, then I expect some skill. You’re doing a tutorial where you’re the tutor, you have to be good at it. I’ve seen a couple of (Malaysian) Youtubers do eyeshadow tutorials and their eyeshadow look terribly unblended and not smooth. I like your POV. Makeup for everyday look. I think it helps makeup noobs like me although frankly, I don’t read that many makeup posts in the first place. But on to your question…I think the issue is the blogging scene is “spoiled” by makeup gurus who set up expectations above the average standards. So some readers are less forgiving when they compare apple to apple. As a beauty blogger, I stay away from discussing makeup except for foundations because I’m blank with makeup. I fear the attacks…haha…am cowardly yes. Hahaha.. this reminds me of a certain year when I was pretty active going to events. To me, they were normal but then as time proceed I find this strange reaction from the public. Some how bloggers are like models/ambassador or so called expert in that area esp. since they did the reviews or appeared on this that media. For some strange reason, they were expected to have great skin, good image & etc. 24/7? I also find it funny when I go for fitness workshop or marathon and the bloggers ended up appearing with full makeup. And what’s even funnier when they remark on some bloggers that appeared sans makeup. Means puffy eyes, red skin, no eyebrow etc. which is what a fresh face after exercise supposed to look like. Now these reaction where not only limited to female. But guys as well. Ahaha coz. I’ve worked behind the scene. The makeup artist & hair guy will also discuss on stuffs lk tht. … which reminds me of the time during my childhood (80’s). My neighbor was a former beauty queen who at that time worked as a fly attendant & model. So in the eyes of the public she was woah vavavoom. Hardly appear during the day. Only at night, once a while she will come out. Now one night, she forgotten to bring money to “tapao”. Coincidentally, my brother & his gang were cycling around the neighborhood. So she stopped my bro. to borrow some cash. Now my bro could not recognize her & had the shock of his life, speed off. According to him, the sight of her fair white pale, black lips, dark eyes.. and no eyebrows with long hair gave him goose bumps. Apparently, one of my bro’s friend lend her some money, so the next day, she came to my house to return it looking all perfect. At tht time, I argued with him.. coz. I did not believe how could anyone’s image change so drastically esp. no eyebrows, panda eyes. I even told him, he must have mistaken someone for that “Lenglui Cheh Cheh” (Pretty Sister). Now all grown up. I realized… being a woman.. & maintaining a beautiful image is not easy. HAHAHAHA..
Nah, it’s a plus point if beauty bloggers are an expert in doing makeup, but it’s not a big deal if they aren’t. However, if the said beauty blogger is also a makeup artist (ie getting paid for jobs), then yes, I expect them to be an expert. Otherwise let’s all just have fun painting our faces in whatever way we want eh? I don’t expect beauty bloggers to be expert at makeup application. It’s nice if they are, but it’s not everything and sometimes it’s not enough. I do expect bloggers to be honest and ethical – I stopped following some bloggers when they did things I considered unethical. I like reviews for real people, too. Which is why I love Lisa Eldridge but don’t pay too much attention to her reviews 🙂 My lack of skill makes a big difference. I have to say though – I think you’re really good at makeup! Ah ethics and blogging – it’s a topic we could talk about forever, mostly because people have different concepts about what’s ethical – or they say they’re being ethical… but go and do something else LOL! Thank you – I never thought I was very good at makeup, as some of my old pictures will show hehe… But thank you anyway.